Bobbin co-owner Gyllian Svensson writes in an email that this “is an idea that we’ve been working on at The Bobbin for a while now; we were just waiting for the right act to really launch the project.” When local musician Jarmac T. Harvys told her Talcum was coming to play a show at Gezellig Theatre — the performance space he runs with Radio Bean owner Lee Anderson — Svensson suggested he stop by The Bobbin first. “Joe Jack was all for it, so the event was born,” she says. Will the singer get down and dirty with the printmaking? “I’m not sure how much of a crafter Joe Jack is,” says Svensson, adding that she “did ask for his input.” She hopes to make Craft With the Band happen several times a year. Tickets for this one are going fast, but those who don’t snag them may be able to catch Joe Jack Talcum playing with 17th Fire, Train Wreck Kelly and Goldtown the same evening. Craft on! Saturday, June 6, at The Bobbin Sew Bar & Craft Lounge, Burlington, 2-5 p.m. $7 includes materials. Info, 862-7417. 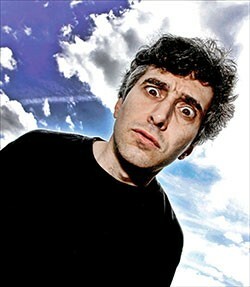 Joe Jack Talcum plays the same evening at Gezellig Theatre, 8 p.m. - 1 a.m. $7. Tickets available at Radio Bean and The Bobbin.